The self and the avatar - a topic could probably be discussed until doomsday, and I will no doubt come back to it in later posts with new ideas or affirmations of the ones begun here. You're getting the idea of how this works already, no doubt. In an article written about virtual avatars, Bailenson and Segovia suggest that there can be no connection between the Real Self and the Virtual Self if there is no physical resemblance between the two. I think that this is a very interesting idea, and can perhaps be seen within my own experiences. When it came to representing myself physically, I felt much less of an impulse to be honest than I had with my personality. Initially, I gave the idea of making my avatar look like me no time, and simply played with what was on offer in the default library of clothing. However, when others arrived to help me customise myself, they thought that my work was a little ridiculous, and sought to find for me items from the Second Life Marketplace so that I looked less new and more ‘realistic’. It was then that I started to grow a little uncomfortable with the way I was being represented. The main items I was issued with were some long red hair and an Animation Override that turned the default duck-waddle way of walking into a style that wouldn’t have been out of place on a catwalk. I felt as if I had been instantly feminised in the extreme, and when I protested against the AO, half with amusement, half with discomfort, I was told that ‘that is how women walk in Second Life’, that this made me attractive. I had the option, of course, to deactivate the item and return to the default, and I didn’t have to wear the red hair, but my friend’s statement that this was how I was ‘meant’ to look and be made me wonder if I wasn’t just being childish in resisting. I liked the claw, okay?! 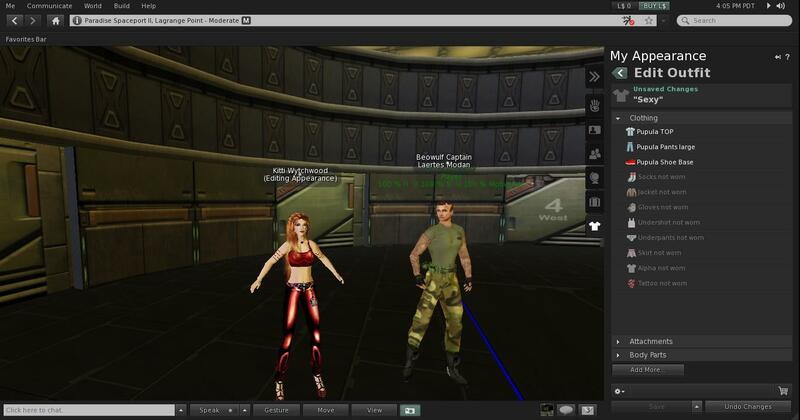 In the beginning, as you may have glimpsed from previous screenshots, my avatar looked like this (left). She was built entirely using the SL default library of clothing which, helpfully, is arranged in folders such as "female student outfit", "female cyborg outfit", "female city outfit", etc etc. You have the ability to put on items from different folders, but as you can see from the screenie, the trousers I'd taken from the city outfit or whatever did not fit with the pink boots I'd take from the cyborg folder. The boots didn't know whether they were under or over my clothes. The black jacket was actually from the men's library - you have access to both - and looks like I spray-painted it on. For a first attempt, I didn't think she looked too bad. I had learned how to zoom in by then. I was quickly informed otherwise, though the friend who first offered to show me around SL was more concerned about the way I walked and my hair (which I thought was fine, really) than about my odd, too-small boots. He didn't like my claw, mind, and did tell me to take it off...which I only did because, well...not very subtle, is it?! Or friendly. This (right) is the red hair I was first given. Admittedly, it isn't too far from my natural colour, but it earned me the nickname "Red" from the friends I later made, and because of that I became very reluctant to change my hair colour. With all of the freedom of clothing and accessories in SL, it seemed that the only thing making me identifiable as me - or is that Kitti? - in the virtual world was the red hair. I became, rather literally, attached to it, and as you can see in the "about me" section on the right hand side of this blog, my avatar still has red hair now. Possibly the worst thing I was EVER given to wear...seriously! Now that I have learned how to get clothing items myself, my attire has become less "adventurous", and much more within the realms of possibility for my corporeal self. 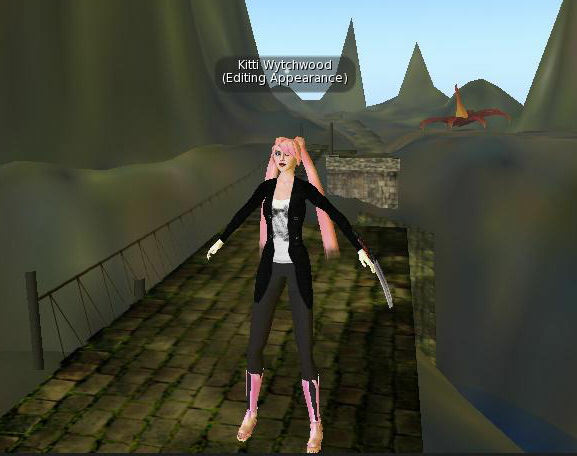 The way my avatar looks now, in her latest incarnation, is not drastically dissimilar to the way my friends contributed to make her look – the way I was uncomfortable with. Her hair is still red, and I am still using the same Animation Override. However, her hairstyle, make-up, and the way she dresses are not far beyond the realms of possibility for myself within the Real World, and this, perhaps is the crux of Bailenson and Segovia’s idea. If the Virtual Self seems impossible to connect to the Real Self, then the former cannot be considered to be a true representation and thus cannot influence the latter, whether that impossibility comes within appearance, personality, or actions. The question this raises now, reading it back, is whether or not that influence is wanted. If you are engaging with Second Life to get away from your first life, maybe this disconnection between avatar and self offers a chance to move away from or beyond the first world. If SL is simply a part of something within the Real World, as it is for me, then this disconnection is dishonest - and that is why I was uncomfortable with it. It also raises an emotion that is new to me - a kind of jealousy of myself. From the attention my avatar was receiving in SL, I realised that the bunch of pixels making up Kitti were generally perceived to be attractive, and I joked to a friend - and later, in my module seminar - that I was more attractive in SL than in Real Life. Being a redhead in the age of Amy Pond is fashionable, and the colour instantly turns virtual heads. I was also concerned that this supposedly more-attractive me was representing the more fleshy me in a way that was dishonest on yet another level. The supermodel walk, the red hair, the feminine, revealing clothes - they built this desirable digital creature. But all of these things had been built and scripted by people in the Real World, by their ideas about how women should look and move. So...is this what is expected of me in Real Life, too? As I read I have to comment on one point which I whole heartedly disagree. You are far more dazzling a personality than your avatar, far more beautiful and far more charming than pixels will allow. It's foolish to think differently. And if the real world doesn't offer the same attention and desire for affection then England is full of self involved twits who can't look up from the tedium of their daily lives to see a vibrant young woman any man would be better for. Oh my oh my - at last someone other than me telling my gorgeous daughter that she really is an inside and outside gorgeous person - perhaps now she will have a little more faith in herself.